Weyerbacher | Beer Apprentice - Craft Beer News, Reviews, Interviews and Info. Hello everyone. I hope you are having a great day. Well, I am, and today I’m going to be trying a Weyerbacher Insanity produced by the Weyerbacher Brewing Company in Easton, Pennsylvania. This will the first time that I’ve ever tried a brew by Weyerbacher and I want to thank Adam Hudak and Stephanie Suratos for sending me this bottle. Let’s see if we can find a description of the Insanity on the website, weyerbacher.com. Insanity is made by aging our perfectly balanced Blithering Idiot Barleywine in oak bourbon casks. This incredible combination creates a mélange of flavors from rich malts, raisins, and dates to oak, vanilla, and bourbon. Let’s give this baby a try. This beer has an ABV of 11.1% and it comes in a 12 oz. bottle. The brew poured a clear, deep, ruby color with some brighter ruby highlights around the edges. It had an off white head of adequate size that was smooth and creamy with plenty of alcohol legs showing on the sides of the snifter. The retention time was good and the lacing hung around for a bit, but eventually disappeared back into the liquid after a moment or two. The aroma revealed hints of vanilla and oak/wood with dark fruits of grapes, plums and black cherries. A decent waft of Bourbon whiskey and caramel malt were noticed as the brew warmed as well. It also started to reveal a significant sweetness, which counterbalanced that Bourbon to some extent. Not a bad aroma at all here. Within the taste, the Bourbon really stood out initially. Followed by sweet fruits of grapes, cherries and plums. A significant hint of vanilla and oak came on stronger through the middle. I even found a little bit of chocolate and caramel malt at the back end too. The only thing that was throwing me off was the fact that after the swallow I got a little bit of a cherry cough syrup taste that became a touch distracting for a few sips. Other than that, the taste was quite good. The mouthfeel was medium bodied, smooth, dry and slightly chewy. The carbonation was of medium aggression and a wonderful alcohol warmth was felt deep within the chest. A good bit of flavor was left behind on the palate also. This is a solid brew for sure. If I had not known that this was classified as an English Barleywine I would have never guessed it. Being aged in Bourbon barrels really adds a nice little twist. I would definitely recommend giving it a try if you see it. It is quite solid all the way around. It is more of a sipper, but when given time to sit and warm it becomes rather pleasing and proper. I would also say that it is geared more for the cooler weather, but it could still be enjoyed during the Spring and Summer if taken in small doses. 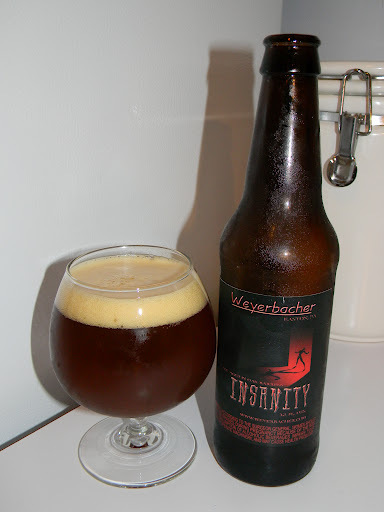 Be sure to let me know what you think of the Weyerbacher Insanity if you try it.